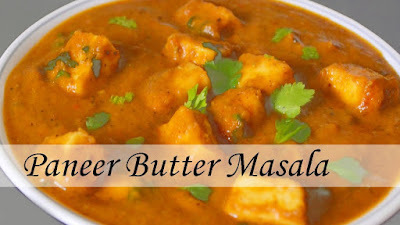 Restaurant style paneer butter masala recipe made easy with simple cooking, can easily be adapted to no onion and no garlic recipe. Heat a pan with oil, fry onions until they turn transparent. Fry tomatoes with salt for 3 minutes. Cook covered till the mixture turns soft and mushy. When the mixture cools, blend it with 1 cup water in a blender to very smooth. Add butter to the same pan, add dry spices and fry for one to 2 minutes. Add ginger garlic paste and saute well until the raw smell disappears. Pour the blended puree, add red chili powder, if desired ¼ to ½ cup of water. Cook for 4 minutes or until the gravy thickens. Let the gravy reach the desired consistency before you add paneer. Add paneer kasuri methi . Stir well and cook for 3 minutes. Can add cream if desired. Transfer butter paneer to a serving bowl and garnish with cream or crushed pepper or coriander leaves. Use sugar only if needed to suit your taste. Onions, cashews and tomatoes lend a sweet flavor and taste to the gravy naturally, so if desired use ¼ to ½ tsp. Recreating popular restaurant style Punjabi dishes at home is my second obsession after eggless baking. Other than this I have already shared palak paneer, kadai paneer, dum aloo, khoya kaju, paneer lababdar, veg handi and so on. I will keep sharing rest till I make all of them. Before making this kind of dishes I refer cookbooks, Sanjeevji’s and Tarlaji’s website and I come up with the recipe or ingredients proportion which suits my taste. I do make couple of time, after making required changes I share it here. And trust me all of them tastes fantastic and delicious. Add chopped tomatoes and mix well. Cook till tomatoes are soft. Add turmeric powder, coriander powder and red chili powder. Now wipe out the pan using paper napkin to clean it. In the same pan heat the butter and oil on medium heat. Add whole spices (cinnamon, cloves, cardamom and bay leaf). Saute for a minute or till you get nice aroma of spices. Add ginger and garlic paste. Cook for a minute or till the raw smell goes away. Add prepared onion-tomato paste and add remaining salt. Cook till all the moisture evaporates and it becomes like a thick paste. Do stir to make sure that it is not sticking to the bottom of the pan. Add kashmiri red chili powder for color and green cardamom powder. In photo it looks a lot, but trust me kashmiri chili powder is not spicy at all and it gives nice red color. Mix well and cook for a minute. Then add water to make gravy consistency. Lastly add cream. Stir and let it simmer for 2 minutes, so paneer gets heat up. Turn off the stove and it is ready to serve.